Michelle has a good eye. Hard to be absolute on a photo, but I think you have a belemnite rostrum. 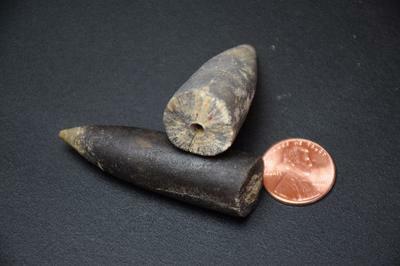 Belemnites are an extinct relative of today's squid. They lived in the Mesozoic era during the Jurassic and Cretaceous Periods. Your fossil is the rostrum. It served as an internal skeleton for this animal.